Snowtroopers are the Empire’s specialized assault unit focusing on hostile environments. They are trained and equipped to keep pressing forward even in the worst conditions. In Star Wars: Legion the Snowtroopers are the Imperials second corps unit option. Their trainining and equipment make them hardy and versatile against all odds - and as such see specialized use in the Imperial forces. Snowtroopers are assault units and as such want to be constantly pushing forward and engaging the enemy at short range where they are most effective. They can also clear mission areas and hold points in the process. The base unit of Snowtroopers are deceiving on paper, they have below average damage output and speed and no above average stats to make up the difference. Unlike Stormtroopers, they also lack a mitigating factor for their below average damage output. However they have the steady keyword which means they are able to take a free ranged attack after a move. If you combine two of the Snowtroopers speed 1 moves it is a similar distance to a speed 3 move and they still get their attack which situationally makes their speed above average, or if they are suppressed they can use their one action for a speed 1 move and free attack making their courage situationally above average. Flamethrower: The flamethrower is the missing piece that brings the whole unit together. The flamethrower is range 1 and has the blast and spray keyword meaning it ignores cover and adds its dice once for each enemy in the target unit. Because it is hard to determine how many targets will be in a unit we will assume an average of 5 because the weapons preferred target is troop units who can be between 4-6 troopers. At 5 targets the flamethrower increases damage output from 1.5 to 4.625 making this unit above average in damage output once the flamethrower gets into range, increasing damage output even further by ignoring cover. Because of how much the flamethrower increases Snowtrooper efficiency it is strongly recommended. T-7 Ion: The T-7 Ion is the Imperials first available source for ion tokens. The gun is range 1-2 and adds 1.875 damage plus Impact 1 and Ion 1 to the attack. The gun exhausts to attack though making prioritizing its shots important. Its black and two white dice make it a reliable weapon to split fire with. However because the unit does not natively have any other synergy with anti-armor and the Imperials don’t have any trouble damaging armor at the moment, this weapon is not recommended (this may change as vehicles are added to the game). Because the flamethrower makes the Snowtroopers so much more efficient it is rare to deploy them without it. It is also a good idea to equip them with grenades because they works at the same range as the flamethrower and changes their white die to a black die increasing their damage output substantially from 4.625 to 6.25. Because the flamethrower already adds blast to the attack pool impact grenades are a better investment than concussion grenades allowing the Snowtroopers to deal with troop swarms or armor at close range. It is also a good idea to add an extra trooper to the unit to increase the units wounds and time they are on the table making them a very efficient 85 point unit as long as they can make it into range 1. 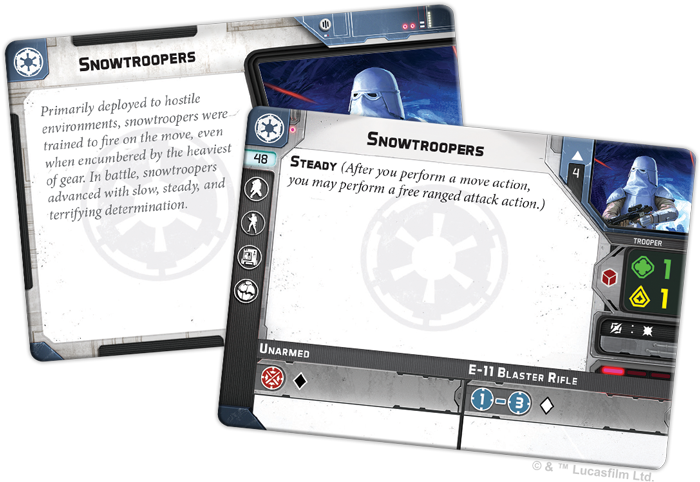 With the addition of wave 3 expansions the Snowtroopers now have access to several new and useful upgrade options. Fragmentation Grenades: These are incredibly strong on your corps troops, just a 4 man unit with grenades increases their damage output from 1.5 to 3.5 making them almost as effective as an 80 point unit for just 53 points, if you increase to the 5th trooper and Flamethrower you are now outputting an outstanding 7.5 damage at range 1 for a 85 points! this is a strongly recommended upgrade on Snowtroopers. Recon Intel: for just 2 points this gives your unit scout 2, which is a pretty good benefit. If you have the points to spare you should consider it to get them to the action faster, but its not essential. Officer Upgrade: The Officer Upgrade takes the slot of your generic trooper upgrade and costs 8 points more. For the difference you are gaining an extra point of courage making these units able to play farther from your commander. they also gain Inspire 1 which makes them a great rally point for the rest of your troops to center around. The officer is recommended because the extra point of courage is often the difference of them getting one action or two. Snowtroopers may seem straightforward on paper, pushing forward and attacking. However there are some subtleties to the strategy when you do so. When playing Snowtroopers you want to make sure that they are at the forefront of your advancing forces, but also not to the point where they are the only target, otherwise they get will get shot to death before they can do any work. It is best to have them advance through cover using their speed one as an advantage, because they can’t be slowed further you still get their full effectiveness even when moving through difficult terrain. Keep them behind LoS blocking terrain or at least cover until they are within range to flamethrower their target. If they can’t stay behind terrain then follow their advance with with DLT-19 stormtrooper squads or some other unit that can put damage out at long range, use the Snowtroopers steady shot and the support unit to add suppression to units that could fire on the Snowtroopers. The damage and suppression on the enemy will keep their attacks against the Snowtrooeprs from being as effective as it could be. Because Snowtroopers are typically equipped with a flamethrower and impact grenades, they can handle any target they come across in their advance. Often I find they are very effective if they can split fire with the flamethrower targeting a large troop unit and the grenades targeting a second unit of troops or a vehicle. Depending on your opponents army composition and the target units sometimes it is better to cripple two units than to destroy one entirely. Snowtroopers should also always be moving and shooting, it is rarely an optimal choice to dodge or aim (although I wont say never). If there is LoS blocking cover near an objective and they don't want to advance further it is a great strategy to use their first action to leave cover, use their steady attack, and then their remaining action to return to cover. When playing across from Snowtroopers keep in mind that they are counting on their speed, action economy, and getting close to do any real work. All three of these are mitigated by suppression tokens. If you can keep them surpassed then their effective speed 3 move drops down to speed 1 and keeps them out of range 1 dropping their 6.25 damage (flamer and grenades) down to 2.5 making them very inefficient for their 85 points. If you can keep them suppressed for the majority of the game then they are not a threat and you can focus your more meaningful activations at dealing with longer range threats. However if they are able to use terrain to their advantage and stay out of LoS as they approach then they will be dangerous. The best way is to keep a safe distance (beyond range 1) of where the Snowtroopers will emerge from terrain and attack. If you cant avoid the area because of the objective, then it is also a good idea to keep a unit on stand by in a location where the Snowtroopers will trigger it. It is important to note that when Snowtroopers move and trigger stand by that the stand by happens before the Snowtrooepers get their attack from steady, even though they are happening one after the other - stand by interrupts and happens first.